A classical example of specific inhibition of binding of the aminoacyl-tRNA with the A site of a bacterial 70S ribosome is provided by tetracyclines (Fig. 10.8). Tetracyclines also inhibit the codon-dependent binding of the aminoacyl-tRNA with the isolated 30S subunit. In agreement with this, the specific binding site for tetracycline has been detected on the 30S subunit. 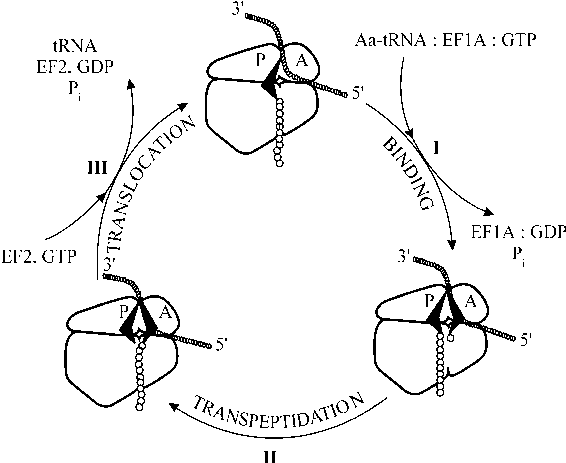 It is noteworthy that when the ternary Aa-tRNA:EF-Tu:GTP complex interacts with the 70S ribosome in the presence of tetracycline, GTP undergoes hydrolysis and EF-Tu:GDP is released but aminoacyl-tRNA does not remain in a bound state. It is likely that tetracycline bound on the 30S ribosomal subunit in the region of tRNA-binding sites decreases the affinity of the A site to tRNA. On the other hand, a pre-bound aminoacyl-tRNA impedes the binding of tetracycline to the ribosome. Thus, tetracycline and aminoacyl-tRNA are competitive with each other. As classical tetracyclines, such as unsubstituted tetracycline, chlortetracycline and oxytetracycline (Fig. 10.8), possess relatively low binding constants, their inhibitory effect on ribosomes stronly depends on their concentration in the medium, as well as on the concentration of the competitive aminoacyl-tRNA, rather than simply on drug-to-ribosome ratio. Next generation tetracycline derivatives, e.g., minocycline, have significantly higher affinity to ribosomes and correspondingly exert stronger inhibitory effect (or required in lower concentrations). Especially high affinity to ribosomes is imparted by dimethylglycyl group at position 9 (the so-called glycylcyclines, or DMG-tetracyclines, Fig. 10.8); such tetracyclines are very efficient against bacterial ribosomes and may overcome tetracycline resistance of many drug-resistant strains. r protein, called Tet(M), or Tet(O), or Tet(S), depending on the resistant strain, appears in the cell; the protein interacts with the bacterial ribosome in a GTP-dependent manner and removes the bound tetracycline from it. It is interesting that the protein has been found to be a homolog of the bacterial EF-G, ribosomal translocase (see below, Section 12.2.1). Translocation of tetracycline from the ribosomal A site may be a mechanism of the protective action of Tet(M) and related proteins. The highest-affinity tetracycline derivatives, however, cannot be removed by this protein from the bacterial ribosome.